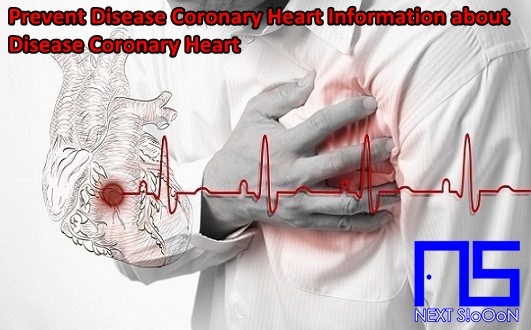 In this article Next Siooon will discuss about Disease Coronary Heart, Information includes Understanding - Symptoms - And How to Prevent Disease Coronary Heart. Disease Coronary Heart - heart disease caused by accumulation of cholesterol, fat, or other substances in the walls of blood vessels. The heart is the vital organ of the central blood flow in the body. The age that continues to age results in blood vessels not elastic like when they were young. Older age will cause various cells in the body to weaken. Coronary heart disease is a disease that is medically called Ischemic Heart Disease. This disease is very dangerous because it becomes a number of factors that cause death with a percentage reaching 21%. Therefore we must know the problem of coronary heart disease in order to maintain a healthier life. Prevention will be better than cure, it is because when it's sick we will feel it. The following is information about Coronary Heart Disease that you need to know. When the coronary artery (the artery that supplies blood to the heart muscle) becomes hardened and narrows. This is due to the accumulation of cholesterol and other ingredients, called plaques, on the walls of blood vessels. This buildup is called atherosclerosis. As time goes on, the plaque gets bigger so that the blood flow to the heart muscle gets smaller and more difficult. As a result, the heart muscle cannot get the blood or oxygen needed. When the tissue lacks intake, it will cause tightness and pain in the chest. If the coronary artery is completely blocked, then the patient can fall into a condition of a heart attack. This heart attack is a medical emergency because it causes permanent heart damage or even death. Many doctors declare a serious status to patients who have a heart attack. That is because if they are handled late it will have a bad impact even to death. Feels chest pain or chest discomfort, this pain can spread to the neck, jaw, shoulders, and left hand, back, left side of the abdomen (often considered an ulcer). This pain is mild to severe. This chest pain is called "angina" which can last for several minutes. If the plaque has not completely blocked the coronary arteries, angina will subside on its own. If angina persists, then immediately bring yourself to the doctor. Then it will feel cold sweat, nausea, vomiting, or easy fatigue. An unstable heart rate rhythm (arrhythmia) can even cause cardiac arrest (sudden cardiac arrest) which if not treated quickly can cause death. In patients who have coronary heart disease, handling coronary heart disease is the first treatment in the ED to provide stability to the patient. After that, the treatment of coronary heart disease that must be consumed as an outpatient medication is the treatment of sublingual nitroglycerin and aspilet. The doctor will provide treatment for coronary heart disease in accordance with the health conditions that you experience and do not forget to always consult during the treatment process for this coronary heart. The hospital will prioritize the procedure so that it always checks health and maintains healthy eating patterns or intake. In addition, the family is encouraged to always entertain and not to experience stress. Especially keeping patients from a variety of sad news that will make his condition worse. Take care of your health by exercising regularly besides consuming lots of water with balanced vegetable fruit. From now on so that our old age stays healthy and strong, protect our bodies from various dangerous diseases. Coronary Heart Disease, Coronary Heart Disease Information, Coronary Heart Disease Article, Coronary Heart Disease Information, Coronary Heart Symptoms, Causes of Coronary Heart Disease, Factors Causing Coronary Heart Disease, Coronary Heart Disease Impacts, Coronary Heart Medication, Relief of Coronary Heart Symptoms, Overcoming Coronary Heart Symptoms, Coronary Heart Disease Symptoms, Coronary Heart Disease Management , Things to do with Coronary Heart, What is Coronary Heart, Definition of Coronary Heart, Information on Understanding Coronary Heart, Symptoms of Cause and How to Overcome Coronary Heart, Coronary Heart Detail Info, Tips to Relieve Coronary Heart, Tips to Overcome Coronary Heart Disease, Overview of Information About Coronary Heart, recognize the causes and symptoms of Coronary Heart, prevent Coronary Heart by knowing the symptoms and causes.